I hope you are in the mood for a fabric giveaway! Today Fat Quarter Shop is here with a fun one for you! 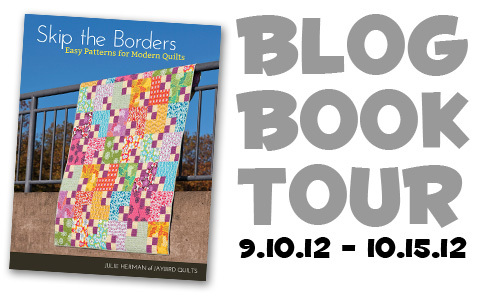 We are almost halfway through my Skip the Borders Blog Tour! I've enjoying reading all the comments on each of the stops. Fat Quarter Shop did a great review. If you missed it you can still enter to win a copy of my book. All these posts about the book have me wondering... What is your favorite quilt in the book??? I know you might not have seen them all yet... but I still want to know!! 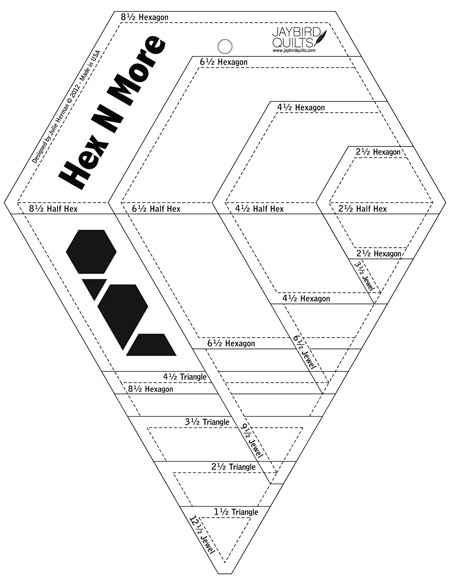 I also want to remind you that my Hex N More Ruler is the Notion of the Month at Fat Quarter Shop. You have one week left to get it at 20% off! With this giveaway we are going to have two winners! 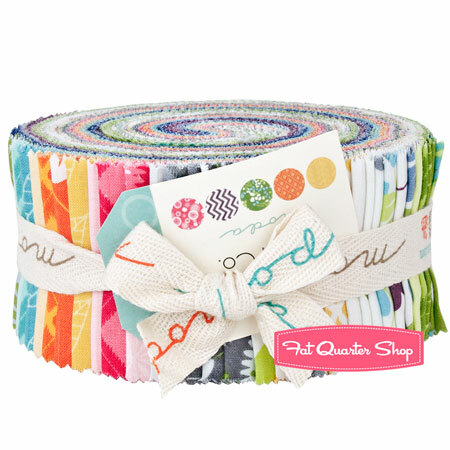 One winner will get this Jelly Roll of Simply Color by V&Co. 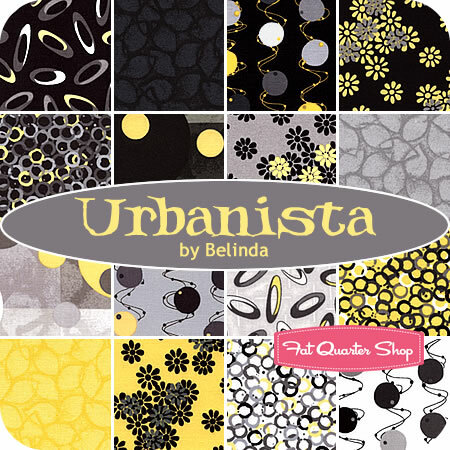 The second winner will get this Fat Quarter Bundle of Urbanista by Belinda. 2. In your comment tell me what quilt from my book is your favorite so far. You can see some of them in the many posts I've been doing for my Blog Book Tour. Personally my favorite is Framed Coins. I love the mix of the solid green fabrics with the assorted black and white prints. You have till 9PM PST on Thursday the 27th to enter. Giveaway now closed. Winners announced soon. Winners will be selected by True Random Number Generator. Sooo cute, Wonderful book Julie! Raspberry Dessert is my favorite. It is so visually striking. Raspberry Dessert. Every time I see it, I want to eat raspberry cheesecake! Rows of bricks is my favorite! My favorite one is Raspberry Deserts because it's pink and I just love it. Raspberry dessert by far is my favorite. Thanks. Raspberry Dessert is my favourite. I remember an early post of yours that showed how great it looks in so many different colours.Thanks for the giveaway and congratulations once again on the book. Box of chocolates for sure. I love lots of color! Looks like raspberry dessert is not just my favorite! I love that quilt! Well, I said it yesterday and seems like everyone here agrees with me - Raspberry Dessert! It's so hard to choose just one that I love from your book! I've already started piecing three versions of Framed Coins already for Christmas presents, in some bold yellow, black, gray and white patterned strips. But I think Four Patch Shift will be my big project for the winter and it will be for my daughter's big girl bed which she'll move to next spring. Thanks so much for the chance to enter, and even bigger thanks for all of the inspiration and helpful instructions in your book and on your blog! Floating Triangles is great!! Love the colors and how modern it looks. My favorite is the floating triangles! Thanks for the giveaway. I love Framed Coins Julie....second is Raspberry Dessert.....wonderful!! I like the way your version of Raspberry dessert almost glows, but I think the quilt I'm most likely to make is framed coins. Thanks for sharing. I really like the floating triangles. The dark background with the bright triangles really makes them pop. It is modern minimalist at its best. I would have to say Framed Coins is my favorite. Thanks for the giveaway! Definitely Box of Chocolates . . . I mean who doesn't love that?? Raspberry dessert is my favorite - I love the post you did on examples of other color options! White Stars. I love the different backgrounds, and how the white stars just POP. My favorite of the day is Floating Triangles. Tomorrow it may be another. Your book has so many beautiful and inspiring quilts that it is difficult to choose a favorite. I love the contrast, the asymmetrical design, and the big impact for a relatively small quilt. I am a big fan of Julie's! Box of chocolates hands down that is a great pattern! I love raspberry dessert. I think this is my favorite! Thanks for this chance to win. I like box of chocolates - i love the scrappy mix of fabrics! My favorite would have to be Raspberry desert. It would be lovely in orange, or even nice chocolaty browns. I have to agree with the majority here...Raspberry Dessert is my favorite!! I love Raspberry Desert!!!! Wonderful book!! Thanks! Box of Chocolates! Besides the reference to one of my favorite things (and one of my favorite movies! ), the colors are scrumptious! I love the Framed Coins Quilt! Four Patch Shift is my favorite. The pattern doesn't have any triangles so I think I can do it! The colors are lovely too. I like Box of Chocolates. so pretty! I love Floating Triangles! thanks! I just love the Floating Triangles quilt! Very quick and easy! I already have Dot Dot Dash underway! It's my fav. 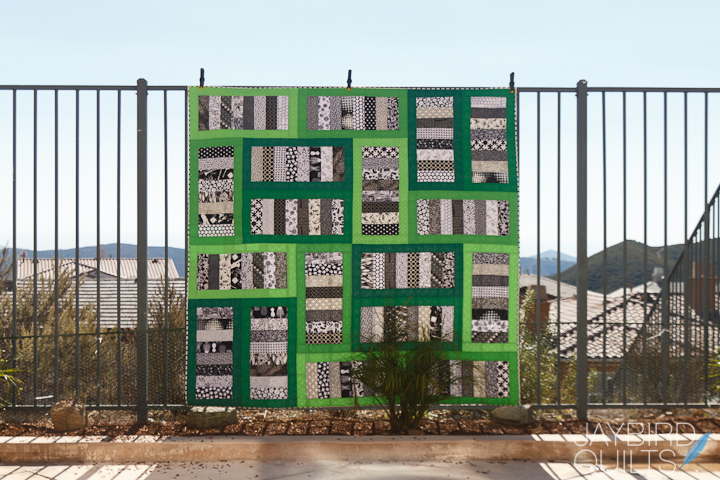 I love the Radio Way baby quilt, the design is simple and striking and I love the idea of completing a quilt top in just a couple of hours! It's very dificult, but I like some much Raspberry desert. I love your blog, it's very interesting for me. Floating triangles caught my eye! I have loved Raspberry Dessert since the first time that I saw it. I recently saw both "Simply Color" and "Urbanista", and I'm drooling. Thanks fort he giveaway! HELLO! I THINK 'RASPBERRY DESSERT' IS MY FAVORITE! THANKS FOR SHARING! It is definitely hard to pick a favorite. Right now Four Patch Shift stands out to me. I just love squares in a quilt. Raspberry Dessert is my favorite. Thanks for the give away. Hard one, Julie. But, I will pick Floating Triangles! My favorite is the Raspberry Dessert. I really like the pinks you used (and I'm not a pink fan) but can also see it in so many different color combinations. Thanks for the opportunity to enter your wonderful giveaway! my favorite is a tie between floating triangles and raspberry dessert with RD slightly edging out FT. No, maybe the other way around. I can't decide! Thanks for the opportunity! Great book with lots of great quilts! I love them all! But will probably make Raspberry Dessert first. I am also anxious to use your ruler, I just bought it from the Fat Quarter Shop earlier this month! Love the Raspberry Dessert--glad you've included it in the book! sending my compliments to the new Hex N More Ruler, I bought it already. Will play with it next weekend at a retreat. Haven't seen your book yet, but the quilts you showed are great. Please put my name into the virtual hat. love the raspberry dessert and he rows of bricks one! I actually like all the quilts, but especially am drawn to Box of Chocolates and Raspberry Dessert. Thanks for the opportunity. I am really drawn to WHITE STARS and think it would look great with SO MANY different fabric lines! I love this book. I bought it specifically for the floating triangles and raspberry dessert quilts. LOVE them both! And I just love the book as a whole. I think it is too hard to choose! But The Four Patch Sift is really great. My favorite is 4 patch shift! Thanks for the chance to win! Box of Chocolates - love the name, and I love the simple square within a square blocks! I love raspberry dessert! Thanks! For me it's Floating Triangles, love the colours pop out of the brown! My favorite is raspberry dessert! Loved how different it looked with different fabrics! Thanks for the giveaway! I love Box of Chocolates - what a fantastic way to feature larger prints and make good use of some of the pretty blenders available now! :) Thanks for the chance! I really like the box of chocolates one! 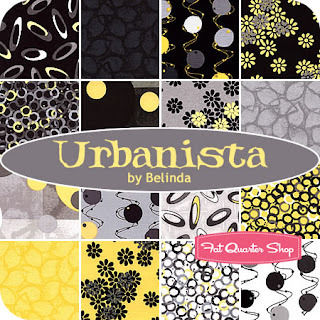 And, I'd love a chance to win urbanista!!!! Thanks for a great giveaway! My favourite is Four patch shift, the book cover quilt! I love the colors you used, and am thinking of making this with Simply Color!!! I like dot dot dash, my colors and heavily quilted just how I like also. I think Box of Chocolates is my favorite! My favorite is Raspberry Dessert. I love being able to see how different it can look with the variations you've been showing. What a nice giveaway. That jellyroll would make a pretty quilt! I love raspberry dessert! It is just so pretty! They are all great, but Floating Triangles is the stand-out for me!! Thank you for the wonderful giveaway. I love Box of Chocolates. Squares are favorite pieces. I think my favorite is White Stars, but Raspberry Dessert is right up there too! I don't really use quilt books very much (I should) but I think the favorite I have is Scrap Basket Surprises. I've made a few quilts from it and they are great. I like Raspberry Dessert closely followed by White Stars because I love all star blocks! Framed Coins is my favorite, added to my sewing list! I really like the Box of Chocolates quilt. Very colorful! Box of Chocolates!! I love the mixtures of the colors and the patterns. Kinda like "you never know what you're gonna get." I am so drawn to Row of Bricks...amazing fabric choices. But am equally in love with Box of Chocolates...don't make me choose!Congrats on the book! Box Of Chocolates looks yummy. Floating triangles is simply THE BEST. I makes me a bit dizzy though ;o) Just love it. If I weren't afraid of triangles I'd make one right away! Thanks for the chance to win!!! My favorite quilt is actually the cover quilt Four Patch Shift. It's a very lively design that keeps me engaged. Great for large scale prints too. My fave is raspberry dessert. I love the way it 'pops' with energy. I'm getting the book just to make that quilt. Hard choice - but I will say Four Patch Shift. 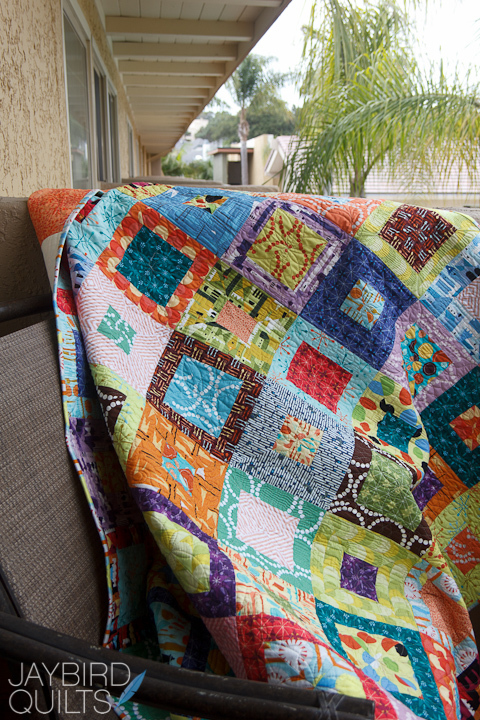 currently, my favorite quilt in your fabulous book is 'framed coins!' i've a b&w layer cake and plenty of green ... i'll just have to make it! have enjoyed all the posts in this great blolg book tour. Four Patch Shift from the cover is my favorite! So many ways to change it up with color variations! I like the four patch shift! There are really SO many quilts from this book that I LOVE, but one that REALLY stands out and makes me WANT TO MAKE is Box of Chocolates! Hmm.. I wonder if the *name* has anything to do with my interest?.. ;-) I think that it's just the amazing variety of color and print that grabs my eye!!! :-) Thank you so much for the chance to win!!! My fave is Raspberry Dessert! Love the Floating Triangles quilt and all the others are awesome too! Thanks for the chance - your prizes are great!! I like the raspberry quilt because of the post where you showed all the different colour combinations it could be made with. I really liked the green apple combination. Box of chocolate! It's on my long to do list. Dot dot dash since that is the one best suites for my current skill level! The floating triangle one would be a great hallenge fore but would be willing to give it a shot! I really like them all, but Dot Dash is probably something that I can finish quickly, and right now I'm in the mood for a quick finish quilt. I've never used a jelly roll before so that would be a treat to win. I'm working on your Radio Way now in Texas A&M fabrics. Can't wait until it's finished. Hard to choose, but I think box of chocolates is my favorite! The list of projects I want to try from your book is LONG! But first up will be my favorite so far - floating triangles! Awesome book, awesome giveaway! I definitely love Rasberry Desert., it look amazing in so many colorway too!!! I would have to say it is a tie between Raspberry Dessert and Floating Triangles. Thanks for sharing your great ideas! I love Raspberry Dessert and love all the other yummy flavors you have shown it in! I love th floating triangles because unsymetrical things just appeal to me. I guess I'm just a little bit off kilter. I love floating triangles. The use of the dark background is so striking. Can't wait to use my scraps for this one! Raspberry Dessert is my favorite. I love diamonds in quilts and this one looks so fast and easy to put together. I love Box of Chocolates. All the colors, and the fact that the blocks aren't simple squares in squares make the quilt unique. I love Raspberry Dessert. I love the way the pattern is arrannged and those pinks sure look yummy. Well, your book is by my bed and I just cannot make up my mind. Chubby Logs, Boxed In or Box of Chocolates. Today it will be Box of Chocolates. Love the book. Box of Chocolates!!! Love love love it! Love all the colors! My favorite is Raspberry Dessert. I love this pattern and the colors that you used are just perfect!! My favorite is Floating Triangles. I love the dramatic background with all that contrast. I want to make that quilt. Great book. My favorite is the Four Patch Shift. Thanks for the chance to win. My favorite at least at the moment is Raspberry Dessert! today it's dot dot dash...tomorrow it may be box of chocolates!! or framed coins! they are all so much fun!! Considering the quilts featured thus far, my favorite is Raspberry Dessert. I love to view the design as positive/negative space. Amazing how the interplay of colored shapes bordered by a neutral background seems to possess two personalities. Box of chocolates of course. No calories at all but all the joy. Thank you for the chance. Floating Triangles! Love the effect you've achieved! So far from what I have seen, I love the cover quilt! Your book looks like a great source of inspiration! Box of Chocolates is my favorite! I love all the quilts. My favourite is the framed coins. I'm making them in miniature to hang on my walls and as mug rugs to match my craft room. I love the pop of green. I love all of them but Raspberry Dessert is my fave. I haven't done too many all solid quilts yet and this one is just amazing! By far my favorite is Floating triangles. So cute! I really like box of chocolate. I think it would be so cool with fussy cut prints. I also love raspberry dessert as I love the pink! Raspberry Dessert is my favorite so far!! Congrats on a great book! Box of Chocolates looks simple to make, but the placement of the prints is beautiful. Thanks for the chance! Raspberry Dessert just jumps out at me.Great design. Thank you for the giveaway. I love framed coins and box of chocolates. Thank you for this giveaway, I hope I win. Dot Dot Dash is awesome. It looks like it would so versatile either as a jelly roll or a scrap quilt. I really like that Dot Dot Dash quilt. I like floating triangles - it is simple but yet, not. My favorite is Floating Triangles. I love the colors against the background fabric. My favorite is Raspberry Dessert! I think it would look good as a Blueberry Dessert, too! Framed Coins is my favorite, although I have always loved Raspberry Dessert! Raspberry Dessert is my fav quilt, especially that although made in raspberry colors in your book you showed us how effective & stunning the design is also made in other colors such as blue!! I love Box of Chocolates! Love your blog, too! I really like the box of chocolates pattern! Raspberry Dessert is my favourite, though there are several others I really like as well. I love Floating Triangles. I love the placement of the colors in Ivy. Love that Box of Chocolates! Hi There! My favorite is the Box of Chocolates - could it be it's because I'm square? I think Floating Triangles is the current favorite. You realize that "favorite" changes frequently!? White Stars is my favorite! I love stars and the way this quilt makes them sparkle just makes me smile! :) Thank you for the chance!! I really love Floating Triangles! Don't think I am copying the example, but I do love framed coins. I am thinking how great would that be in other colorways? I might have to make one, or two or three. Guess I need to get the book, huh? Everyday it changes. Right now I am loving Box of Chocolates. I like Rasberry Desserts too. Julie, without having the book and going simply by your many posts of these gorgeous quilts, I would have to say Rasberry Dessert in pinks and reds. It is just so vibrant. It has a 3-D effect as well, and the eye cannot help but be drawn to the color and design. Love it! Thanks for the opportunity to leave my comment for one of the fabulous gifts from Fat Quarter Shop! I love Box of Chocolate! I like Dot Dot Dash. It would great in any colors and would be a good way to use up strips and scraps. 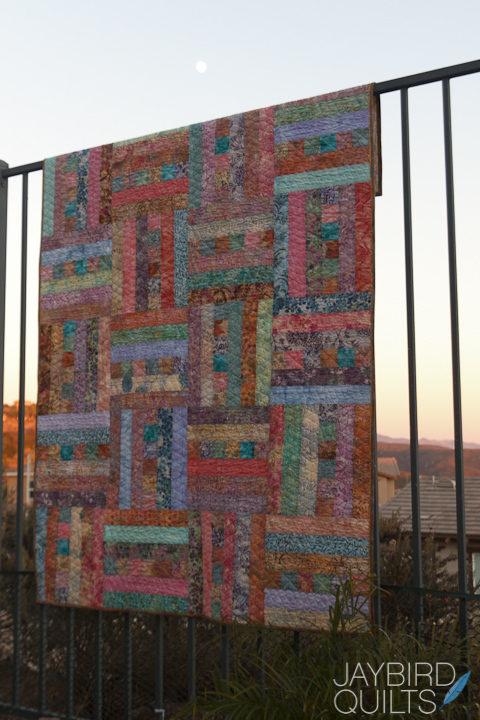 I love the look of a scrappy quilt -- so interesting to look at! I like the Dot Dot Dash. It would make a beautiful baby quilt. Thank you for the giveaway! I love the colours used in Box of chocolates , so that would be my favourite! Keep up the good work. I love the look of floating triangles! It is one I feel confident that I could accomplish as well! Thanks for the chance! I like Box of Chocolates. The colors are crazy and it looks like it would be cozy to curl up with watching Fall TV! I love the Rows of Bricks! My favorite is Raspberry Delight. I love the triangles! My mind sees the quilt in chocolate and ice blue. I love Raspberry Delight, but I think I would do it in shades of yellow for a Lemon Merienge (sp) Pie. It looks so pretty, I just love it! Thank you for the giveaway! I can't wait to get my hands on your book! I am also jumping on the Raspberry Deserts bandwagon. I would like to try it in different colours though. Thanks so much for a fantastic giveaway. Raspberry Dessert is gorgeous. Thank you for the generous giveaway. I love Box of Chocolates, looks like it would work great with my scraps, or even better, with a collection of batiks. I have been enjoying seeing the quilts from the book. I like them all. But my favorite for most of the hop has been the box of chocolates, don't know if it is the name or the square in a square. But then yesterday I came across the floating triangles and I think that is my current favorite. I think the black background does it. while floating triangles shouted at me, I really liked raspberry desert and how the quilt changed looks with the change of fabrics, a very versitile pattern to be sure. I love all the movement in Floating Triangles. Fabulous! My favorite pattern is Box of Chocolates because it's so colorful, AND because I like chocolate! Love the Framed Coins--I can see it in so many different color combinations and would also be a great stash buster! My fav so far is the 4 patch shift!! I'm getting your ruler, I can't wait to use it. I'm loving the raspberry dessert quilt! The colors are fabulous and I love the 3-dimension effect. I also love the other color options you show, so many choices and different looks in one design. Although I don't love browns, I do love the floating triangles quilt. Very nice. Thanks for the chance to win! My favorite is floating triangles as like the chocolate background and the arrangement of the triangles to form secondary patterns. Those triangles really do float! Raspberry Dessert! Thanks for the giveaway! My favorite has to be Box of Chocolates. I like the color combinations and the fact that you can use up some of the fabric you have stashed in that tote in your closet. I love Framed Coins! I'm a such for a neutral color with bright colors! Love the way it makes the color pop. Floating coins. Done in a rainbow of solids would look great! My favorite so far is Four Patch Shift. I love the way the four patches dance across the quilt top, taking your eyes with them. I like the offset triangles. Made me do a doubletake. I loved Raspberry Dessert since I saw it in the magazine. My daughter saw it on the web and said she would love it. I finished it a few months ago and it's currently being quilted. I'll post a picture on your Flicker group when I get it back. It went together quickly and looks terrific. Kathie L in Allentown. My favorite quilt so far is Raspberry Dessert. I love the colors and I love the 3D effect. Thanks for the great giveaway.